Probably a couple of months ago now I asked on Twitter for recommendations for a reasonably priced but good spot cleanser for makeup brushes. I think I only received one response but that was that I should try the B. makeup brush cleanser from Superdrug, which is just £4.99. The reason I haven't picked this up sooner is really just because I've been a bit lazy and not walked across town to get to Superdrug. Although I have walked past a couple of times heading to other places and completely forgotten I needed to nip in. I'm trying to get better at remembering to wash my brushes, but I do regularly forget to do them. I refuse to clean them at my boyfriends (because his bathroom is a bit grim and there's nowhere to dry them where one of three cats might not get hold of them) and when I'm at home I often just completely forget about it. Using an on the spot brush cleanser should never replace actually washing your brushes regularly, but at least it helps to keep them cleanser between washes. I also do suffer with breakouts here and there and I hate the thought that something might transfer to my brush that then transfers back on to my skin later, yuck! One of the last times I washed my brushes I thought they were clean and set them all out to dry. For some reason I took a peak down into the bristles of my expert face brush and was shocked to find a load of foundation and yuckiness right down in the base of the bristles. I was worried about having to wash right down into the base of the brush head as I didn't want the bristles to all fall out, but I had to get right in there and it took forever to try and get it all out. I was pleased to find that it didn't damage the brush at all, I don't think a one has fallen out, but I really don't want it to get into that state again and spot cleansing will definitely help with this. The cleanser is super easy to use. You just spray it onto a tissue or cotton bad, swirl your brush around on the tissue or pad and then leave it for a few minutes to dry. You can spray this directly onto your brushes but I find this a little bit wasteful as some of the spray just dissipates into the air. If you use this every time you use your brushes, or at least every few uses, then your brushes will stay looking clean and fresh. It's also good for if you're using the same eye brushes for different shades of eye shadow and want a 'clean' brush for each new shade you use. Although this leaves your brushes damp rather wet just make sure you give the brush a minute or two to dry between each shade. I'm probably still going to forget to wash my brushes as regularly as I should do but at least now I have this cleanser I know they can't be in too bad a state! 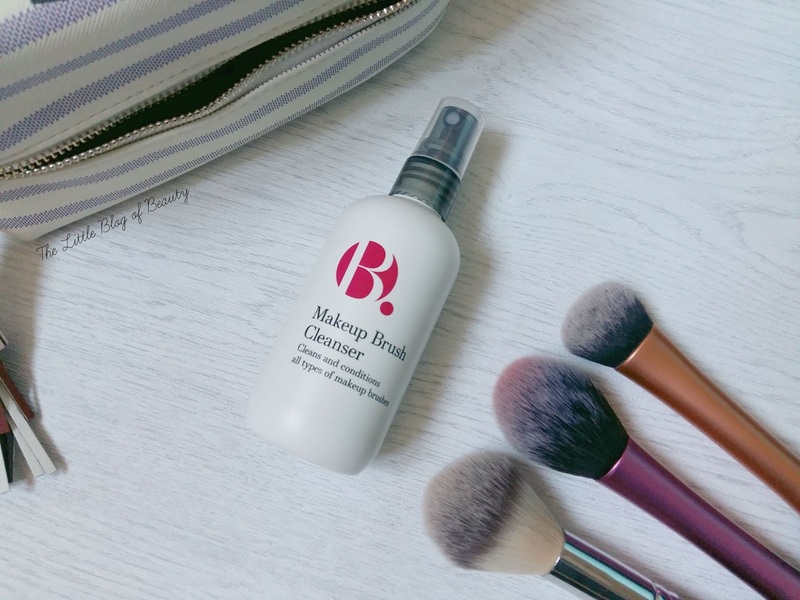 The B. makeup brush cleanser is £4.99 from Superdrug. How regularly do you clean your makeup brushes?